The gold and silver stocks as a group have certainly been a disaster over the past two years. Both GDX and GDXJ are down with GDXJ leading the spiral. Yet, the metals are actually higher. Gold is up quite a bit while silver is up marginally. Because of the volatility in this sector we can certainly choose any period to emphasize a point. However, it is becoming clear that the mining equities are struggling to outperform the metals. In studying the history of this sector (both the stocks and the metals) I’ve learned two things that I will share with you today. First, the large-cap miners have no track record of consistently outperforming gold and second, it is possible to routinely find companies that can outperform the metals. I credit the first point to Steve Saville, who was one of the first to note that the miners do not consistently outperform the metals. In fact, in secular bull markets the stocks consistently underperform gold. Steve’s chart below shows how the miners underperformed badly from 1974 to 1980. Recall that the gold price was fixed until 1971. Thus, both the uptrend from 1964-1968 and the downtrend from 1968-1971 are exaggerated. It is simply a function of geology and numbers. Large companies have an extremely difficult time finding enough deposits and big enough deposits to not only replace reserves but to grow production. It’s much easier for a company to grow from 50K oz Au production to 100K oz Au production than it is for a company to go from 2M oz Au production to 4M oz Au production. Throw in political risk, permitting delays, financing issues and execution issues and it’s understandable why the large companies underperform the metal. This being said, it’s important to take all those XAU vs. gold charts with a grain of salt. Over the long-term, Gold will continue to outperform and that chart will continue to make new lows. Moving along, it is important to examine the relative strength of various gold stocks in particular market cycles. Below we graph the HUI vs. gold. We highlighted the performance during cyclical bull markets. In all three examples we notice that the biggest gains came at the start of the cyclical bull market. 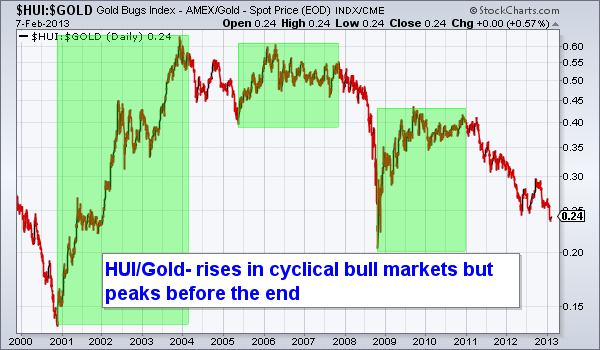 In the last two, the bull market ended as the HUI/gold ratio peaked slightly below its high for the cycle. This tells us that the stocks will strongly outperform at the start of the next cyclical bull but that outperformance will ultimately peak or fade.